If someone told me a few years ago that I would be going to Brazil on a regular basis I would have exclaimed “Really? !” Not because it’s located 5000 miles from American shore or that it’s full of unknown tropical fruits but because for me this country represents a childhood memory of a story told in a book and a movie. There is a famous character in a classic Russian novel whose utmost desire is to visit Brazil and in particular Rio de Janeiro where he believes everyone wears white pants and smokes cigars. You may ask why am I writing about this? Well, this character is so iconic that every time I think of Brazil or go there I can’t help but remember numerous funny quotes from this story. If you are Russian reading this you will know in a heartbeat that the character is Ostap Bender from the novel The Twelve Chairs. Synchronicity, according to Swiss psychiatrist Carl Jung, is the occurrence of two or more events that appear to be meaningfully related but not causally related. It is this synchronicity that connected my passion for that story to my now annual journey to the beautiful country of Brazil. This is my fourth time being there. 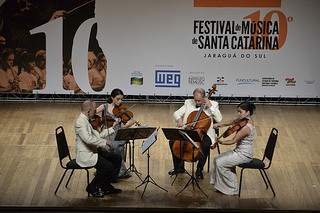 Three of those four times were attending FEMUSC, an International Music Festival of Santa Catarina. It has become a very special place for the Arianna Quartet. We all look forward to being there every year as it is one of the highlights of our season. Each year we meet and get to work with wonderful pre-formed string quartets from around South and North America. This year is no exception. We have four quartets: two from Brazil, one from Colombia and one from the United States. Here are their names: Sorocaba (their 3rd time at Femusc), Oliver Toni, Efferus and Pavo String Quartets. All of them are fantastic. Each group has 3 quartets to work on during the two weeks.The amount of progress they make by the end is astonishing. I am always amazed and thrilled to see the eagerness to learn, the openness to new ideas, the fast development of the technical skills and an enormous amount of energy coming from these FEMUSC quartets. These kind of students are always the biggest source of our inspiration. Teaching is a two way street. It works successfully only if both parties want it to work. Our other favorite thing to do at FEMUSC is to make music with our wonderful friends and colleagues. This year we have several collaborations which include Antal Dorati’s Notturno and Capriccio for oboe and string quartet with Alex Klein, Brahms Viola Quintet with Daniel Guedes; Prokofiev Quintet for oboe, clarinet, violin, viola and bass with Catalin Rotaru, Ovanir Buosi and Alex Klein; and Brahms f minor piano quintet with Alexandre Dossin. It is both an honor and joy to work with these outstanding musicians. By the end of the concert I wish there is another movement or page to play. 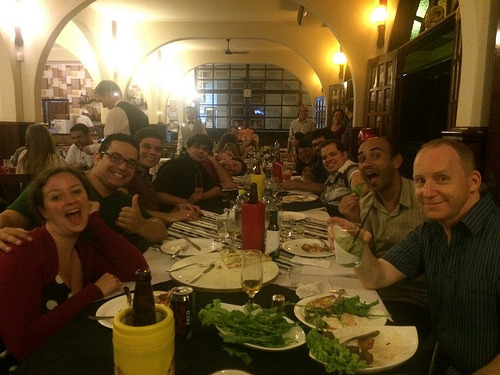 Luckily the night is still young after the concert and we all go to a local pizzeria for a night of celebration, good food and a shot of cachaca, a traditional Brazilian drink! Saude! I would like to take this opportunity and say thank you to the founder and artistic director of FEMUSC Alex Klein. It’s because of his immense vision and tireless energy we all are able to experience this unique music festival. People like him make a difference in our lives. My personal goal for next year is to learn some Portuguese and to be able to carry a simple conversation. It took me 4 times being in Brazil to realize that I need and want to learn this language. It is absolutely beautiful! The sound of it resembles Romanian somewhat, language spoken in Romania and Moldova. I was born in Moldova and though never had an opportunity to learn the language was always interested in being able to speak it. I am going to finish this entry by saying one very important phrase in Portuguese. Actually it’s just one single word but it contains a very deep meaning and is sort of a signature word in Portuguese: Saudade. It means to miss someone or something, to be longing for. 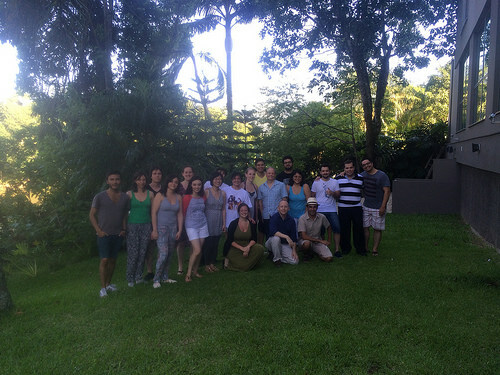 Saudade, Brazil! Until next time. Radio Interview from April 21, 2014 (23.7 MB) - Julia Sakharova, Joanna Mendoza and Alla Voskoboinikova, distinguished faculty at the University of Missouri St. Louis, talk to Kathy Brown about Brahms, Shostakovich and their music making together. 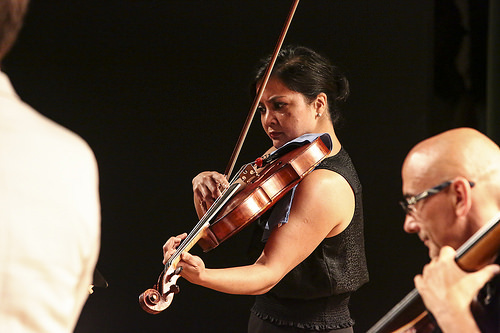 Joanna Mendoza, my colleague and violist of the Arianna String Quartet wrote an inspiring, beautiful and insightful story of the life of a string quartet. I am honored and privileged to be working with such incredible musicians! On October 24 2013 I gave birth to my son. His name is Nikolai. We call him Kolya for short. The name is a Russian version of the name Nicholas which is Greek in origin and which of course is quite common name in the States. He was born on Thursday very early in the morning. His home town is Saint Louis, Missouri. 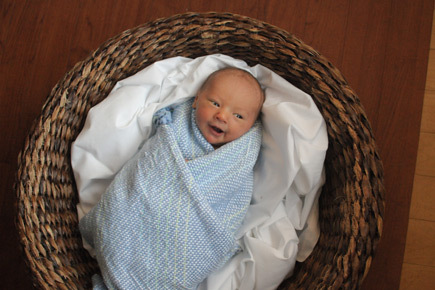 Now that he is almost 6 weeks my husband Clay McKinney and I are slowly but surely assuming the roles of new parents. We are very blessed to have so many wonderful people in our lives, our family, moms who came and stayed with us for the first few weeks to help out with the baby and house chores, and friends who offer wonderful home cooked meals along with wonderful words of advice. Despite his infant age Kolya is on his way to becoming a world traveler. In January the Arianna String Quartet is going to Brazil for two weeks to participate in the FEMUSC International Music Festival. It will be exciting to see Kolya in another country taking it all in at the tender age of 3 months. Because Brazil is located below the equator it will be summer there in January. I am glad Kolya will have a chance to soak in the sun for the whole two weeks. He was born in the late fall in the Midwest and as soon as he was ready to take his first short walks outside it got cold! Now all that’s needed for him to travel is a passport and Brazilian visa.Taking his passport photo deserves a whole separate story. All guidelines need to be changed. First obstacle we had to face was Kolya's closed eyes. Well, that’s all fine and good until it comes to a newborn.There are certain guidelines associated with a passport photo like the picture has to have a white background, be of a certain size, and have a neutral face expression. He was peacefully sleeping when we arrived to post office. Several attempts later he did not want to wake up. Finally after being striped off his blankets and nice footies he started to show some signs of being awake. While trying to hold him upright in front of a white background as per instruction my husband's hands got caught in the shot. All that hard work was for nothing. We had to try again. The lady at the post office kept saying that the picture might be refused by the State Department and that could delay our application. Finally we decided on one of the shots as being the best one. A side note. One of the questions in the application is what color are the eyes. It's a simple enough question…. if you are not dealing with a newborn. The color of their eyes change. This week Kolya's eyes are blue and next week they could be green or brown or gray. What shall we put in the application? Blue going on other colors? I don’t remember what color we ended up putting. Whatever color they turn out to be I hope people at the boarder will let him travel to Brazil even if the color of his eyes don’t match the ones in the passport. I am here with my quartet in Jaragua do Sul, Brazil. This is my first time to travel to the Southern Hemisphere, and what a great way to experience summer time in the middle of a cold winter month in the States. Though the heat is not so bad, most of the day's humidity can interfere with a comfortable way of playing an instrument. The view from my hotel 6th floor room is incredible. Mountains all around! It is amazing how much this place resembles Zhelznovodsk, my family’s hometown in the North Caucus of Russia. The two cities are surrounded by tall, looming mountains and various greens. I hear a bird sing that I believe is a Chickadee. Tomorrow we’ll play a piece written for flute and string quartet. There is a section in the first movement in which flute and first violin respectively imitate this bird by playing exactly the same song. I cannot wait for the music to begin. 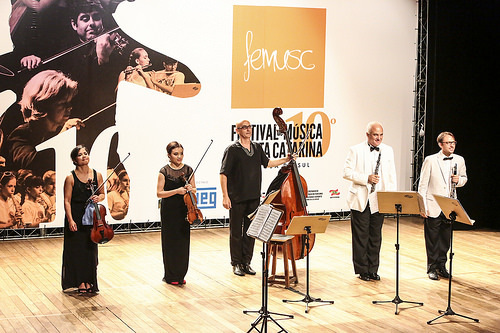 The Arianna String Quartet participates for the third year in a major International Music Festival, known as FEMUSC, which is held in Jaragua do Sul, in southern Brazil. The festival was founded by Alex Klein, a world class oboist and conductor and a former Principal Oboist of the Chicago Symphony Orchestra. The festival involves over 800 students and nearly 100 faculty, representing 22 countries in Europe as well as in North and South America, and presents over 200 regional performances in a 14 day period. The Arianna Quartet is giving performances of seven different works in the course of the two-week festival, including three collaborative programs with internationally acclaimed artists, current and former members of the Chicago Symphony, the San Francisco Symphony, and major orchestras in Rio and Sao Paulo, Brazil. These performances are attended by colleagues from major universities and orchestras from both North and South America. Our repertoire ranges from oldies like Beethoven, Tchaikovsky, Wagner to modern, new age compositions by South American composers. In addition to extensive performing, the quartet is offering daily coaching and masterclasses to five young and really promising string quartets. All five of the groups traveled from different countries: Brazil, Chile, Colombia, Mexico, and United States and their level of playing and commitment is quite high. The quartet's names are: Sorocaba, Antofagasta, Tayrona, Naui-Kira and Mifflin. Personally, and I am quite sure the rest of the quartet feels the same way, that the favorite time of the day is coaching these quartets. Those students are so eager to learn, so hungry for knowledge and so ready to try new things. There is an exuberant joy to make music and unsurpassed desire to grasp the information which is given to them. It’s this kind of student-teacher relationship that makes teaching so rewarding and enjoyable. It inspires me to come up with new ideas, to create new sounds and to look for that extra special something in our playing. The two weeks are going by very fast and although we are quite tired by the end of our stay we almost wished there was another week of intense music making in Jaragua Do Sul. The quartet is immensely grateful for all the wonderful work that is done at the festival and all the beautiful sounds that are created. This experience and memories inspire us to continue in full force with yet another busy season which includes a performance of all the Razumovsky Quartets in one night. We look forward to being at FEMUSC for many years to come. "Arianna Quartet Performs Peruvian-Inspired String Quartet Sunday"
Click here to read the article and view the video. As of September 2012, I am the newest member of the Internationally-acclaimed Arianna String Quartet. 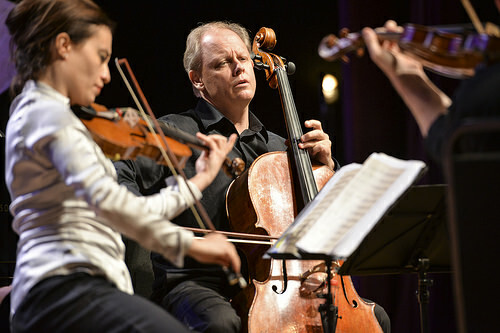 The Quartet is in Residency at the University of Missouri-St. Louis since the year 2000. Our awesome team consists of four people (who would think!) and here they are in score order: John McGrosso violin, Julia Sakharova violin, Joanna Mendoza viola and Kurt Baldwon cello. All four of us are workaholics which means we work a lot. We rehearse every day except weekends for plus minus 3 hours. We teach and maintain our studios. And of course we perform. We perform in and around St. Louis area, we travel to other States and we tour internationally. All of this means that we are highly motivated and dedicated musicians. It's important for us to be connected to people on many different levels. The audience inspires us to perform more. The students energize us to be even more creative. And among ourselves, we strive for perfection. For now I will just say that playing in the string quartet professionally has always been my dream job and I am especially happy to say that I found people who share the same values and level of commitment as I do. They are wonderful! На фото две горы, созданные двумя гигантскими смерчами в одно и тоже время. Тогда еще не было у Земли атмосферы. Наша планета, получив первые лучи тепла от сдетонированного зажженного Солнца, активно переходила из космического холода минус 273' С к плюсовым температурам. Замороженный азот, водород, кислород и другие элементы переходили из твердого, льдообразного состояния в жидкое. Земной шар стал испарять огромные массы пара. Жидкие фракции безграничного океана приходили в подвижное состояние. Среди этого хаоса каменные породы представляли из себя желеобразные структуры на дне жидких масс и начинали вращаться вслед за смерчами. Холм между двумя горами (показан стрелкой) явился иллюстрацией образования двух гор на Северном Кавказе. Слева гора «Спящий лев» — местное название «Развалка», высота 926м; справа «Железная» гора, высота 853м. Природа оставила многочисленные неопровержимые свидетельства этих процессов первой эпохи. This is a story about a wonderful person. On my recent trip to New York City I lost my wallet. This could be the end of the story. One does not expect to find a wallet that is lost in a place like New York City with a population of several million people. I was riding the subway late one night to a friend’s place where I was staying. The following morning I discovered my wallet was missing. All the usual important items were in it: my credit and debit cards, driver’s license, insurance card, AAA, among other cards, and of course, cash. I was desperately trying to remember exactly everything I had kept in that wallet. I told myself that there was absolutely no chance I would get it back. I made phone call after phone call to cancel all cards and change PIN numbers. But what made things worse beyond imagining was that my photo ID had been there , and my flight back to Birmingham, AL was to occur the following morning. How would I possibly catch my flight without my ID? My best bet at this point was to go to the nearest police precinct, at Columbus Circle’s subway station, and file a report. Despite the fact that the precinct was very busy, everyone was really nice there , and an officer and I chatted about classical music and about the countries he’d visited. Hoping he might provide me with an encouraging prognosis of the outcome of this situation, I asked him whether I had any chance of finding my red wallet. “Forget it!” came his short and realistic response. My question had obviously been very naive. About an hour later, I left the station, my report in hand, and feeling I'd done the best I could to secure the replacement of my driver’s license-at least for the purpose of returning home. Upon returning to my friend’s place I began to pack and contemplate my loss. Nowadays, many of us are so addicted to our Facebook accounts ,and most people log in many times a day. I do it too, of course, usually several times a day. Well, on the day I got my police report I did not go to my Facebook page until about 1:00am the following morning just before finally falling asleep after that exhausting day. Little did I know the surprise that awaited me on Facebook. I got a message that night from someone I did not know. It was very short and the title of it was “Red Wallet Found”. To say that my breath was taken away is to say nothing at all! I began jumping on the bed trying very hard to suppress the urge to scream. Was it possible? Who was this person who messaged me? How did she find my name? How could I get the wallet back? All these questions just popped up in my head at the same time. The person’s name was ShaLinda. I immediately sent her a reply with my phone number. Keep in mind it was around 1:30am. My flight was scheduled for 11:00am that same morningI also spent some time in Baltimore as a substitute with the Baltimore Symphony Orchestra, a wonderful ensemble and one I always enjoy playing with. Having finished with that, I took some time off for a cruise with my family, leaving the Port of Baltimore bound for Bermuda. I've never been to Bermuda before, and found it an intriguing place. One can see its definite British heritage, perhaps first and foremost in the cars and driving. The weather was lovely, and the beaches and lagoons astoundingly beautiful. Many wealthy and famous people make their homes on Bermuda, and as a result the property there is quite expensive. Not knowing when to expect the desired phone call I turned on my cell phone just in case. Just as soon as I did that my phone rang; it was an unfamiliar number with a New York City cell phone area code. I answered. “Hi, may I speak to Julia?” -- I heard on the opposite end of the phone line. “This is she” I heard my voice slightly trembling. It was ShaLinda, quite literally an angel! We agreed that the girl’s mother was to meet me at the Burger King by the entrance to one of the subway stations in Queens. I could not sleep the rest of that night experiencing mixed feelings of joy and gratitude for divine providence and kindness. I was at Burger King at 7:00am waiting for the young lady’s mother. She came with her husband and a big smile waving to me. She would not accept any monetary reward that I offered. I pulled out a box of chocolates I had brought to thank the family. Apparently they had already gone to the police themselves while waiting for my response on Facebook. In the event of not meeting me, ShaLinda prepared an envelope and a written note which she was going to mail to me along with the wallet to my Birmingham address. How very thoughtful and kind! I hugged the mother before parting. She told me to keep playing the violin and showed me the print out of the page from my professional website. I was so impressed and touched. I still am! I arrived at the airport, and for a moment thought about using the police report I had so painstakingly filed for instead of my newly restored driver’s license, though the moment passed and I proceeded through security as normal. It was a long summer. Upon finishing the 2008-2009 season with the Birmingham-based Alabama Symphony Orchestra, I had a lot of down time. Here are some highlights from the summer and some of my personal and professional trips. I visited New York City and for the first time, despite living there for 4 years, visited both the Statue of Liberty and Ellis Island. It was an incredible time. The Statue of Liberty was packed with tourists, and a huge, slow moving line (because of security) circled around it as people attempted to enter the statue and scale as high up as security was then allowing (still not to the top). Commerce is rampant on Liberty Island, with overpriced souvenirs and food, but totally worth it for the view one has in all directions. Ellis Island was more sobering. So much history packed away in that little island with its large, beautiful buildings, of the kind that--for whatever reason--no one builds anymore, because they are either too expensive, too beautiful, or just not up to code (or some combination of the above). So many millions of people from around the world first entered America through this point of entry over decades from the late 19th to the early 20th centuries. Their descendants live on today: born and bred Americans. This was poignant for me as 2009 was the year I finally became a naturalized US Citizen. The museum features a database of names for families that entered the US via Ellis Island, some of which were spelled in radically different ways than the names were spelled or pronounced in their original countries and languages, or even different from the way the names evolved into their contemporary forms. I also spent some time in Baltimore as a substitute with the Baltimore Symphony Orchestra, a wonderful ensemble and one I always enjoy playing with. Having finished with that, I took some time off for a cruise with my family, leaving the Port of Baltimore bound for Bermuda. I've never been to Bermuda before, and found it an intriguing place. One can see its definite British heritage, perhaps first and foremost in the cars and driving. The weather was lovely, and the beaches and lagoons astoundingly beautiful. Many wealthy and famous people make their homes on Bermuda, and as a result the property there is quite expensive. I then spent some time in the south of France attending a music festival. 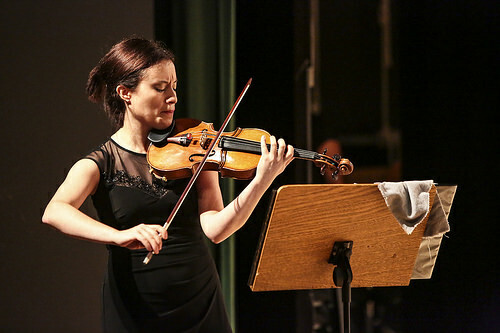 I had the pleasure of seeing and taking lessons with Jacqueline Ross, an eminent specialist in Baroque violin who teaches at London's Guildhall. A wonderful artist, scholar, and person. Sadly, my happiness was marred by an unfortunate event: my laptop was stolen from my room during a performance and has not been recovered. One can never be too careful when traveling, it seems. Upon returning to the USA I prepared myself for the beginning of another exciting season as an assistant concertmaster with the Alabama Symphony. Looking forward to many challenging and enjoyable performances. First of all, I would like offer my apologies for being late with the winter issue of my journal. Time passes so rapidly! It feels as if I moved to Birmingham just yesterday. It is so fresh and clear in my mind. I have been blessed to meet so many wonderful people in Birmingham and make so many great new friends! The Orchestra season is more than half way through. Many new repertoire discoveries, inspiring musical ideas and beautiful sounds! On March 6, 2009 I became a naturalized citizen of the United States of America. This is a very important and meaningful step in my life. I have lived in America for almost ten years now and although my profession does not require me to be a citizen, I felt a strong desire to be part of this country and its people. My first six years here I was on a student visa, also known as the F-1 visa. I had limited rights and privileges without U. S. permanent residency (the famous “green card” that is not actually green) or U. S. citizenship: I could only stay in the country as long as I was studying at an accredited institution, and my ability to earn money was limited to the context of school or private teaching. In 2005 I became a permanent resident and thus I gained many new privileges, namely the ability to work at a normal job and to reside in America for a longer period of time. But with U. S. citizenship come such rights as voting, holding certain public offices (except the presidency of the country), traveling to other countries with an American passport, and obtaining government jobs. Also there are responsibilities: the potential for military service if the law requires it, and jury duty (much more realistic at this point). The ceremony was nice, taking place early Friday morning in downtown Manhattan at a court house. Many people of all ages, social classes and income brackets, and both genders, from every nation were represented there. It took about two hours to process everyone: get them seated, ensure their guests were in the back, and make sure the paperwork was in order. Eventually an elderly judge entered the room and everyone rose to their feet in respect. He administered the oath to use, and we repeated after the court officer who read the oath. Then he gave a brief but moving speech, recounting how his own mother had immigrated from Eastern Europe, in a land that was sometimes my native Russia and sometimes Poland, Jews seeking a new life free from the power politics and suspicions of the old world. He told us about how his mother used to keep all her old immigration documents in a box, and he and his siblings would ask her to bring them down and tell them about her experiences, which should would do: her experiences at Ellis Island. The judge advised us all to go and visit Ellis Island – which I have never done and would very much like to do. Then my husband Nathan and I left the court with my new certificate. No pictures were allowed in the building, but we did manage to sneak one near the giant statue of Lady Justice, blind, holding her sword and scales, before being told sternly to move on. I would like to wish you all a very Happy Thanksgiving! For those of you who have been following my professional career, I would like to update you on recent changes in my life. As of September, 2008, I have assumed the Assistant Concertmaster position with the Alabama Symphony Orchestra, located in the beautiful city of Birmingham, Alabama. I moved down here from New York City at the end of August and so far it has been an amazing experience working with other musicians, performing in concerts every week, and learning a vast orchestral repertoire. There are many great things that fascinate me about this orchestra. I think its history serves as wonderful example of why I am so delighted to be part of it. For more information about the Alabama Symphony's history, it's concert season and information about orchestral musicians please visit www.alabamasymphony.org. Aside from my wonderful new job I am exploring the Birmingham area. I am driving a lot. However, I am also a fairly new driver. In New York I was almost always taking the subway, and in other places I was usually given rides by others. Now I am responsible for driving myself. I like to study maps and when I go to a new place like a new shopping center or a museum I make sure to follow up with an extensive study of all different ways how to get there, so I don't get lost and get to learn about the area. I must admit that like so many other people from the North, I did not think much of the South at first and had my doubts about living down here. Little did I know how wrong I was; little do so many northerners know how wrong they are in their prejudices. Birmingham has turned out to be one of the best places I have lived. And I have traveled all over the world. It is truly the best kept secret of the South. It is a fairly a small city, well that is compared to something like New York City. The population of the greater Birmingham is about 1 million. The city is famous for having one of the best schools of medicine nationwide which is part of the University of Alabama - Birmingham (UAB). Our beautiful Jemison concert hall which is the official home of the Alabama Symphony Orchestra is part of the UAB campus, see http://en.wikipedia.org/wiki/Alys_Robinson_Stephens_Performing_Arts_Center. For those of you who are gourmet food lovers Birmingham offers just about every cuisine of the world from Indian and Mediterranean to French and Italian. Among many other exciting things Birmingham has a fantastic art museum, gorgeous botanical gardens, a spectacular zoo, and a marvelous library system. So now when I hear someone speaking poorly about the South I do not believe them and instead encourage to come and visit this beautiful and historic part of the country. I am enjoying myself immensely. The summer is typically a slower time in the classical music world. I have just returned from a three-week vacation in Russia. Some of the places I visited in the Greater Caucasus mountain range include the Karachaevo-Cherkessia and Kabardino-Balkaria regions, majestic Elbrus, the highest mountain in Europe (standing at 5,642 meters/18,510 feet), and some ancient cities of the Scythian and Alanian people, with their beautiful but seldom (if at all) used churches and other architectural landmarks dating back to the ninth and tenth centuries. In Kabardino-Balkaria I visited a breathtaking blue lake in the absolutely mesmerizing Chegem Waterfall area. In some areas the blue lake goes as deep as 365 meters. That is about 1100 feet! I was told by the experts that because of its depth and frigid temperature swimming in this lake would not be the smartest idea (one would probably be committing suicide) though in all fairness there were cases in the past when some brave native Caucasian people would take the risk and swim across it. The temperature of the lake remains the same throughout the year, at 9.3 degrees Centigrade (approximately 48 degrees Fahrenheit). Not warm enough for swimming, by my standards. 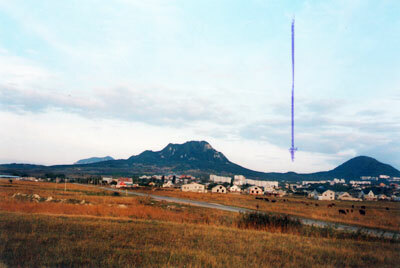 The Karachaevo-Cherkessia area was inhabited in ancient times by the Alans, a warlike nomadic people, who spoke an Indo-European language akin to Iranian. Supposedly they inherited their territory from the Scythians, whom they probably drove out and/or assimilated. Part of the Alan people eventually settled in the Caucasus around the seventh century. By about the ninth century, the kingdom of Alania had arisen and had been converted to Christianity by Byzantine missionaries. An archbishopric was established in western Alania under the authority of the Patriarchate of Constantinople, and many large churches were constructed. I saw some of these ancient churches, some in good condition and others barely archaeological excavations, in Arkhyz, Shoana, and Senty. After its conversion, Alania eventually became a powerful state in the Caucasus, profiting greatly from the legendary Silk Road to China, which passed through its territory. From the Middle Ages onwards, Alania was beset by external enemies and suffered repeated invasions. The invasions of the Mongols and Tatars in the thirteenth century decimated the population, whose descendants are now known as the Ossetians. Islam was introduced in the seventeenth century through the Kabardians, a Muslim-Caucasian people. Military incursions by the Tatar Khanate of Crimea and the Ottoman Empire eventually pushed Alania/Ossetia into an alliance with Russia in the eighteenth century. North Ossetia was among the first areas of the northern Caucasus to come under Russian authority, starting in 1774, and the capital, Vladikavkaz, was the first Russian military outpost in the region. By 1806, Ossetia was completely under Russian control. In some way, shape, or form all people of the modern Caucasus, myself included, have Alanian blood – a testimony to the historic regional importance of the Alanian/Ossetian people. The next stop on my journey was a place where one can see the face of Christ carved on top of a high crag in the mountains. The legend of how the face of Christ appeared on the rock was related to me as follows: In the eighth and ninth centuries there arose in the Byzantine Empire the Iconoclastic movement, possibly as the result of Islamic influence. Iconoclasm saw most Christian iconography as a violation of Old Testament precepts against carving graven images of the deity for use in worship. The Iconoclasts gained influence at court and agitated for the deliberate destruction of Byzantine Orthodox culture's unique artistic and spiritual iconography. The Iconoclasts were bitterly opposed by the Iconodules, the defenders of icon veneration, who were accused of worshipping the images as idols. During the persecution of icons and their devotees, there was a monk who escaped the empire and settled somewhere in the Caucasus. Because he could not bring any icons with him at that time, he instead made an image of Christ by carving it in the rock. I wanted very much to see the face with my own eyes. This meant that I had to climb up about one whole mile! I had practically no experience climbing rocks or mountains before. As you can imagine the amount of stress was enormous. The major part of the way was not that difficult. It was the last three meters (about 9 feet) where the climbing became especially difficult for me. There it was practically vertical, requiring skillful use of one’s hands to continue ascending. There was grass growing on top of the rocks and I was initially holding on to it to stay attached to the crag. Big mistake! One should only use the rock during climbing, lest the grass come out of the soil it grows in and leave you in a nasty situation: my advice for you future mountaineers. Finally I made it to the very top and after spending about ten minutes climbing that last three meter distance. After I venerated the image the worst part awaited me: climbing down! Until then I always thought that the hardest part of climbing was the ascent. Apparently that is not so. Coming down is by far the hardest. As you can well figure out by reading all this I made it safely down to the bottom. The remaining part of that busy day was spent putting myself back together. In the end, I had no regrets and was happy to be able to climb this high upwards, with God’s help. Although there are many things deserving of change in the world, the one I would focus on is one which I could realistically have some impact on: the way children – and people in general – are educated about classical music. It seems that many children of various ages are having little if any exposure to great classical music. Often they grow up writing off the music of Bach, Mozart, Beethoven, Brahms, and others as something which has nothing to do with their lives, and which is only for very special people. They ultimately find it boring and miss out on the wealth of emotions and ideas which the music conveys all because they were never exposed to the music and never learned how to listen to it. As a career performing artist who has been exposed to classical music since childhood, I find the lack of consistent and complete education in this area, if only on the level of appreciation, to be disturbing. It is not simply a matter of the fact that if we do not recruit a new generation of classical music lovers, then our whole art, to say nothing of our professions, will collapse. It is a tragedy in itself to see great art which is both timeless and yet speaks to every particular experience of the human condition so sadly ignored. With my personal goals of becoming a more skillful performer, increasing my abilities and adding to my repertoire, I have made it a point to try and work with the community, whether in public or private schools, colleges, senior citizen community centers, hospitals, nursing homes, or hospices; to use music to bring some beauty and artistic depth to people for whom this music always inevitably ends up being a source of enjoyment and fascination. In my performances, I like to include historical, biographical, and technical information on the form and style of the music, pointing out an interesting phrase here, or a clever word painting there, so as to arouse the curiosity of the audience. I usually end with a brief question and answer session, and also try to get audience input and reactions to see what they took away from it. However, this is only a start, and effort must be undertaken on a broader level. Conservatories could conceivably encourage such community involvement by more musicians as a means to this end. Furthermore, the curriculums of grade schools and high schools need to receive increased funding for the arts to teach children to appreciate various kinds of art – an appreciation from which they and society would only benefit. It is sad to think that, for all their imperfections, the Middle Ages and Renaissance were times when people believed that to possess no skill in music showed signs of incompleteness and poor education. Today such illiteracy is all but institutionalized. If the performing arts – particularly classical music – are to have a successful future, we must all do something to ensure that people understand and love them. Otherwise we risk consigning them to an ultra specialized niche for which the demand will be small, and which will mean nothing to the rest of the world. When I started the process of putting my website together I naturally had to make some important decisions such as what should be the website’s general outlook? How many pages it should have? And what kind of pages do I want to have? I knew right from the start I wanted to have a “Journal” page. I’ve always enjoyed writing and found it an extremely creative and powerful form of mediation. My husband Nathan, who is a talented writer, has been a tremendous inspiration in that respect. I was absolutely convinced in the beginning that I will be able to deliver an issue of the journal every month but unfortunately this has not been the case due to various reasons and life circumstances. However, I promise from now on to be more regular in my writing and not to miss so many months! So here we go. How about some childhood memories to make up for a long silence? I am sure every musician has their own personal story about how they began their musical formation. I have my own unique one. I was about five years old. One day in my birthplace, the city of Kishinev, my mother, grandmother, and I were walking by a music school which happened to be the Special Music School under the State Conservatory. What happened next was a brief consultation between two adults after which they decided to check my musical aptitude and see if I had any kind of special gift, or an “ear” for music. “At least the child’s time would not be wasted being on the street all day,” was my grandma’s comment. I was met in the school by a piano teacher who checked my ear, sense of rhythm, and other necessary skills for a musician. It was quickly determined by her that I indeed possessed the whole range of musical gifts. The next step was to decide what instrument I should take up. Well, since my mother is a professional pianist, the piano was first on the list. However, this grand instrument was quickly ruled out due to my small hands. The cello, although quite a strong candidate, was also rejected. This time the reason was that the cello is quite a heavy instrument to carry around. There is a saying that third time is the lucky one. So that was the case with my third choice: the violin. I remember vaguely the first lessons. I was told by mother that apparently at my first violin lesson I picked up the tiny 1/8 size violin and put it under my chin without any help from my teacher. She was so impressed by this that she turned to my mother and asked whether I had any previous experience with the violin. I had only seen one a few times on television during some symphony orchestra performances. But I had never been exposed to the violin myself until my first lesson. 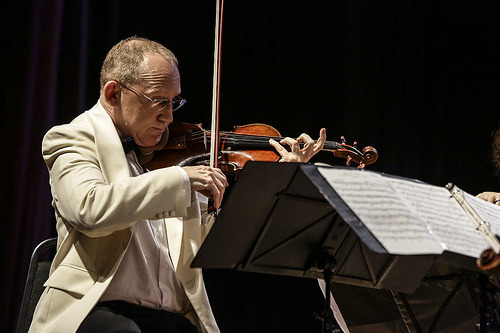 Here is a good moment to mention that throughout my professional life as a violinist, until I recently started teaching students myself, I had always wondered why my old teacher was so impressed by the fact I could put the violin correctly under the chin all by myself! Let me tell you it is not easy! In fact the proper placement of the violin can take some people (kids particularly) quite a bit of time. It is very crucial that the correct hold of the instrument is acquired from the start of the learning process. I cannot stress enough the importance of this fundamental technique every time I teach a beginning student. Less than a year had passed from the moment I had my first violin lesson till my first public performance at the age of seven. By then I could read the music quite well and was starting to explore the bass clef. The very first performance I had was with the Moldavian Folk Orchestra which included many native instruments. I was one of the soloists playing Romanian/Moldavian folk songs. I remember wearing a Moldavian national costume which was especially made for me (I was the only child performing at that concert and the orchestra did not have my size dress so they had to make one). That moment has been very memorable for me ever since: minutes before going up to the stage for the first time in my entire life, mom is asking me if I am nervous and whether I will be okay on stage. I tell her not to worry about it and assure her that if something were to happen I will be just fine and in case I make a mistake I will find my way out of it and nobody will even notice it. Wow! I wish I was that free and confident now. I wish I would never get nervous going on stage; wish I never was bothered by the thought of making mistakes or actually making them. Music and art in general, unlike some types of sports, are really very subjective that there is no one correct way to do things. It is a blessing and a curse at the same time. One is faced with infinite possibilities and decisions creating the danger of becoming too free and undisciplined. There are so many performers nowadays who, although technically brilliant, lack a certain amount of musical taste. Too often a performance becomes mannered and chopped up into little pieces, showing off the performer’s instrumental skills and virtuosity but articulating no musical ideas as a whole. It is a life-long goal of mine to strive to conquer these challenges and achieve the right balance in musical interpretation. Teaching a Master Class is an art. It is not easy. It is definitely not like teaching a regular lesson. One has to think not only about a performer on a stage but about the audience as well. It is sort of a concert where both player and “master” get equal attention and judgment. Many times in my professional life I attended master classes given by reputable musicians and—unfortunately—experienced extreme boredom. This was either due to the lack of a certain presence on stage and or because the class simply was not inspiring. In a few cases the teachers spoke so softly to the students that the audience had to guess what they were saying to the students. I have to admit I felt quite irritated by not hearing a word. There have also been incidents when a teacher would start philosophizing about an idea relating to this or that methodical/historical/mathematical/artistic approach. This can be very overwhelming to some people who are not quite ready yet for a ‘lecture’ on their performance (I personally do not mind this). I remember one time at a festival’s master class one very well known and respectable violinist who was giving a master class spent about good 10 minutes putting rosin on a student’s bow hair. He was convinced that by putting a huge amount of rosin into the hair the sound would get much greater. This he did during the master class in front of a large audience while the poor student was totally dumbfounded. This episode is rather an exception and belongs truly to the category of a joke. There are cases when teachers try to work on too many technical details—even suggesting that students change their fundamental technique and attempting to get them to do it right then and there, thus spending the entire class on things that are more appropriately done in regular lessons instead of at an annual master class. Unless you know that student very well and have actually taught him or her in the past these kinds of things take a little more than half an hour. Instead of turning it into a lesson one can simply inspire students with artistic ideas, give direction and guide to practicing difficult passages and even work on some of them. However it is important not to forget about the audience who in turn are there to enjoy, learn and be satisfied. After all, they are the ones who buy tickets to the class and maintain the level of interest. I was recently giving a master class myself for the first time. It was not easy. I tried to incorporate all the points I discussed above based on my own observations of other people’s classes and make it enjoyable for both student and audience. Even though this is not my personal writing I share the same point of view about the discussed issue with the author of the article below. Please take time to read it in its entirety. It is worth it! The world has changed enormously over the past 100 years, and piano playing with it. It is no surprise that in a world dominated by technology and efficiency, musical priorities have changed. Fidelity to the printed text has taken pride of place over freedom, intellect over imagination, structure over spontaneity, objectivity over emotion, and analysis over intuition. Today it is far better not to get too involved with the music, but instead to present it with a certain “respect”. I occasionally give lectures on the differences between 19th century piano playing and that of today. Never intending to convince that one style is better than the other, I instead present the best from both eras and let people decide for themselves which they prefer. To my surprise, I invariably find that the non-professionals in the audience greatly prefer the historical recordings (to some they are a revelation) whereas the professional musicians, academicians and critics often find reasons to dismiss the “old-fashioned” performances. This divided response has left me wondering if the public is really getting what it wants or is simply accepting what is being fed. Out of all the piano recitals I’ve attended over the past fifteen years I can count on one hand the times where I have been truly moved or heard a sound so hauntingly beautiful that I could never forget it. When I say ‘moved’, I refer not to the excitement and electricity of a virtuosic reading, but to those rare occasions where one is deeply touched inside, those moments where one feels great joy or suffering along with the artist, and those elusive instances where time comes to a standstill. And on those momentous occasions, was I in the presence of one of the world’s most highly regarded artists – an E.Kissin, a M.Argerich, or an A.Brendel? Sadly not. There was a time when people went to concerts especially to experience such feelings. They wanted to be transported to a higher plane, to forget the horrors of the world or the mundane nature of everyday life. But today we’ve either settled for – or set for ourselves – a much different standard. In times past, a Josef Hofmann recital could leave its audience emotionally drained. Recitals by Vladimir Sofronitssky were described as spiritual events, and those who heard Edwin Fischer play often left feeling more in touch with their own humanity. While their sort of piano playing may have become a lost art, what worries me even more is whether we are slowly becoming oblivious to such playing or even unable to recognize it when exposed to it. Why does music have to be unemotional because it has structure? Beethoven didn’t break pianos through his desire to convey a work’s structural architecture. Chopin didn’t admire Liszt’s pianism because of its reserved intellectuality, and it wasn’t a calculated detachment meant to “let the music speak for itself” with which Anton Rubinstein moved people to tears. What made their performances legendary and unforgettable was an overwhelming emotional impact. We as listeners need to demand more from our performers. Maybe if interpreters showed a little less ‘respect’, and a lot more involvement and feeling then new life could be injected into the classical music world before we completely forget that music should be – first and foremost – an emotional experience. "We are close to witnessing an immense historical event. This will, for sure, be part of the history books and it has been long-awaited (for seventy years) by people who are not witnesses to it today. The upcoming re-unification of the Russian church and its branch, the Russian Orthodox Church Outside of Russia is something that has practically no historical precedent. The overwhelming majority of schisms and splits, if we look back to history, did not lead to unity. This split, on the other hand, will be mended by unity. 1. ROCOR canonized and venerated the Royal Family as saints much earlier than ROC did. 2. ROCOR canonized and began venerating the new martyrs of the Russian Orthodox Church much earlier as well. 3. ROCOR could not accept the policies and tactics of Met. Sergius (his “compromise”, seen as softness, with regard to the Soviet government). Now, the Russian Orthodox Church has canonized the New Martyrs of Russia (in 2000) and the Royal Family and not without the efforts of St. Tikhon’s University. We currently have an immense database (30,000 New Martyrs and their fate) which is only becoming larger every day. We have published books about them as well, including a six volumes just about the New Martyrs of Butovo. Thousands and thousands of sufferers were brought to Butovo, just outside of Moscow , and shot there. Then they were thrown into the ground and bulldozed over. Our University, back then only an Institute, was the first to erect a large wooden cross at the site. We were also the first to serve Liturgy in the small wooden church, which was built later. Two years ago Metropolitan Laurus and Patriarch Aleksey put in the first stone of the cathedral, which is now ready to be consecrated (on June 19th). Its main Altar will be dedicated to the Resurrection of Christ. But also, because of the union of the two churches, the second Altar will be dedicated to St. John of Shanghai. He was canonized by ROCOR, but not yet by the Russian Orthodox Church. So this is another wonderful part of re-unification – we get new saints to venerate and pray to. Finally, Communion with each other, Westerners coming to Russia , will bring us all closer and perhaps Westerners will see the beauty of Russia and Russian Orthodoxy once more. Seventy years of separation has brought us back, through a miracle of God, to re-unification!" The first month of 2007 went by quite fast. I spent most of my time practicing, playing concerts, teaching and working on future projects. Well, that’s the typical life of a present day musician. In the midst of all this busyness I got to play for the first time in the New York Philharmonic. What a fantastic and rewarding experience that was! The New York Philharmonic is by far the oldest symphony orchestra in the United States, and one of the oldest in the world. It is among the five “big” orchestras in the US. The history of this orchestra goes back to the nineteenth century when, in 1842, it was founded by a group of local musicians led by American-born Ureli Corelli Hill. The Orchestra currently plays some 180 concerts a year. In fact, on December 18, 2004, the Philharmonic gave its 14,000th concert — a milestone unmatched by any other orchestra in the world. The concerts in which I was fortunate enough to participate happened in the last week of January—the renowned Italian Maestro Riccardo Muti conducting. He brought the house down for the three consecutive nights. The all-Italian program consisted of works by Martucci, Verdi and Respighi. All three nights in a row there were long standing ovations from the audiences. Gerhard Oppitz was the soloist featured in the Martucci’s Piano Concerto. Most interesting in the context of these concerts was the fact that one of Martucci’s composition students was Ottorini Respighi, whose Feste romane was also in the program. I’ve always known that the New York Philharmonic could be counted on to give a top-notch performance. Now that I’ve seen them from the inside and have worked with them I know just how great they really are. I hope to continue working with them in the future. I have noticed that the Christmas and New Year celebrations in the United States are quite different from those of Russia. They differ in terms of emphasis on their importance, and the general spirit or energy with which the holidays are celebrated. For instance, here in America Christmas tends to be much more important than the New Year; in Russia the situation is reversed. Christmas in America is a largely secular holiday for many people, centered on buying and giving gifts. Both religious and non-religious people celebrate it this way. Russian Christmas, or any religious holidays for that matter, are hardly celebrated except by practicing Orthodox Christians and other religious people. Taking the place held by Christmas (for Americans) is the New Year for Russians. The New Year is a very festive time in Russia. It is probably the most celebrated and beloved holiday of the year, and is celebrated by all in a secular way similar to the widespread observance of Christmas in the United States. There are different ways people celebrate the New Year in Russia. It tends to be a family holiday with lots of food, drink (alcohol too of course J), great toasts, jokes, and laughs. I have also found this in America, but the emphasis seems to be far less widespread on the New Year overall. In Russia, television serves as a major form of entertainment during the event. There are many different kinds of television shows scheduled for that night, usually culminating in some kind of pop concert. It is a tradition to stay up the whole night or at least most of it. In contrast, while many Americans seem to stay up late, I don’t find quite the same will to stay up the whole night celebrating. Here in America people also tend to leave the television on I have noticed, usually tuned to whatever is going on in New York City’s Times Square, where a ball is dropped at the top of a building. But the ball dropping seems to form the high point of the night here in America. In contrast with America’s tradition of a monthly preparation for Christmas, Russians don’t usually start preparing for the New Year celebration until a few days before the event. December 31st itself is a big day. Sometimes it’s even bigger than the actual New Year’s Day. Warm holiday greetings and best wishes to all!